French astronomers think they found Tatooine in real life and we didn't even have to travel to a galaxy far, far away (well, it's still kind of far). The fictional home of Luke Skywalker is called 2MASS0103(AB)b in real life and it revolves around two suns that move relatively close together. Basically, this planet is in the binary star system just like Tatooine. What's curious about the planet though is that astronomers are currently unsure if it's even a real dictionary definition of a planet. The planet is so big—it's 12-14 times the size of Jupiter for reference—that it may be a brown dwarf (which is a failed star). Philippe Delorme of the Joseph Fourier University in Grenoble, France explains it as "either one of the most massive planets you can form or the lowest-mass star you can imagine." Figuring out the chemical makeup of 2MASS0103(AB)b could confirm the object as a Jupiter-like planet, lending weight to the instability model. 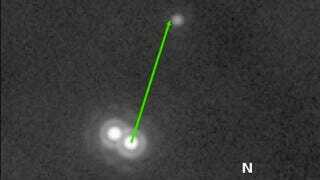 Or it could reveal that the object is in fact a rare type of brown dwarf that was born together with the binary pair. All three would have formed when turbulence inside an embryonic star caused it to break into pieces. That in turn might be crucial to properly identifying such bodies in the future.